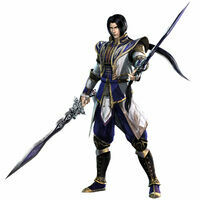 Cao Pi first desires to prove himself as a worthy heir to his father. He accompanies the campaign against Yuan Shao and proves his strength to Zhen Ji. She accepts him and chooses to follow him hence forth. Cao Pi continues to follow his father's campaign at Chi Bi and is disappointed by his father's lack of vision. After Cao Cao's death, Cao Pi takes command over the kingdom of Wei. He tests Shu's might at Jie Ting and deems them weakened enough to invade their lands. With their force defeated, he sets his sights on Wu. Sun Quan makes a preemptive strike at He Fei Castle. Undeterred, he realizes he has his own ambition and succeeds in uniting the land under Wei.